One large circle with a slightly smaller circle on the inside. 1. 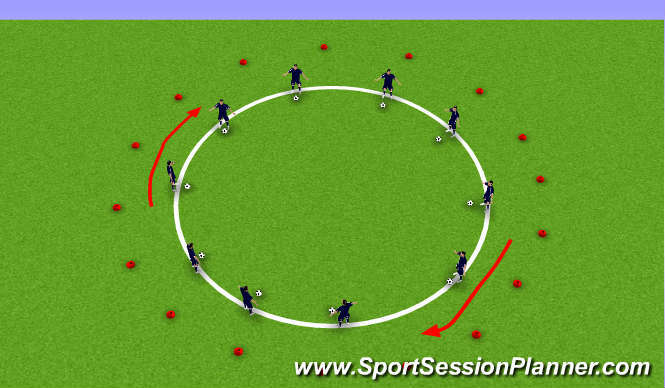 Players have a ball each and are dribbling around the centre of the centre circle, they must evade each other and keep their football at their feet at all times. 2.When the coach blows his/her whistle, the players must accelerate into the channel between the two circles at the nearest point. When in the channel they must dribble around in a clockwise motion until they reach the cone at which they left the centre circle. 3.as soon as they re-enter the circle the players need to start dribbling around once again at a high tempo. This should be completed 3-4 times before progressing. 2. 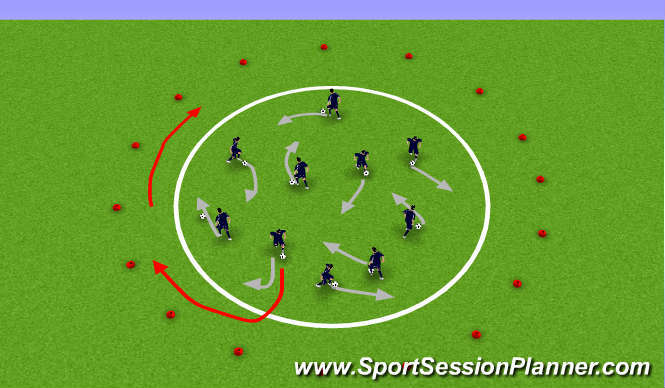 When the coach blows his/her whistle this time, the players are to enter the channel at the nearest cone and to chase the nearest person to them in a clockwise montion, but whilst making sure they keep control of their football. If a players is caught they should perform a forfeit which appropirate to age and ability before re-entering the centre circle. 2.Players should remember the sequence called out, When the coach calls the word &apos;GO&apos; players should perform the sequence followed by a lap of the channel which seperates the two circles. 3.The last 2 players to complete the routine get themself a forfeit.